What's most interesting about the HP Elite x3 is the IP67 certifications for water and dust resistance, as well as the MIL-STD 810-grade salt, fog, humidity, transport shock and thermal shock resistance. How about that? 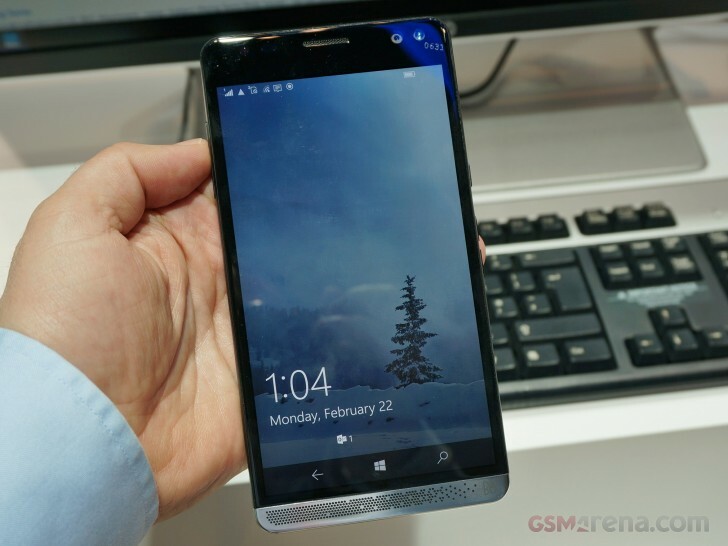 The HP Elite x3 has a big 6" display of 2K resolution (1440 x 2560) and runs on the Snapdragon 820 chipset with 4GB of RAM and 64GB expandable storage. The built-in 4,150 mAh battery should come in handy, too. The phone is mostly made of matte plastic, which surprisingly attracts lots of smudges and fingerprints. The speaker at the bottom is covered with a glossy piece of metal - a nice accent of the B&O speaker. The irregularly dotted pattern is novel and looks beautiful. There is another piece of metal around the rear 16MP camera, too. Here is a quick hands-on video of the Elite x3 in action. HP has also built a couple of accessories for the phone, but we weren't able to spot those at the MWC floors. These are the Desk Dock and Mobile Extender - both are optional. The former includes a DisplayPort, two USB-A and one USB-C port, as well as a wired Ethernet port. You can learn more about those in the news article.